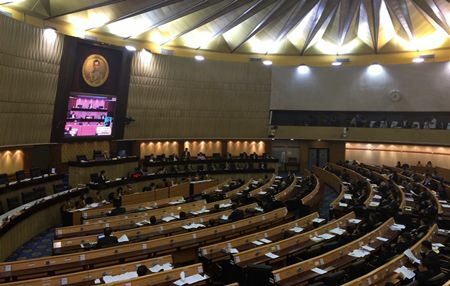 Thailand’s National Legislative Assembly (NLA) has approved the Thai-Chinese Memorandum of Understanding (MoU) agreeing to double track development in Thailand from 2015 to 2022. China will be responsible for construction and system development. Transport Minister Prajin Juntong told the assembly that the Chinese government would help develop the first double track project using standard gauge in Thailand. The project comprises two routes: 734 kilometers from Nong Khai via Nakhon Ratchasima and Kaeng Khoi to the Maptaput port and 133 km from Kaeng Khoi to Bangkok. The minister said that the project would offer long-term benefits to people and facilitate connections between China and ASEAN member states. He said that under the memorandum, China would be responsible for the construction and system development and finance the project. Repayment details have yet to be discussed. Construction is expected to start in 2016 and the memorandum of understanding overrules any similar agreements reached on the project from 2011 to 2013. The NLA approved the MoU unanimously by 187 votes with seven abstentions.